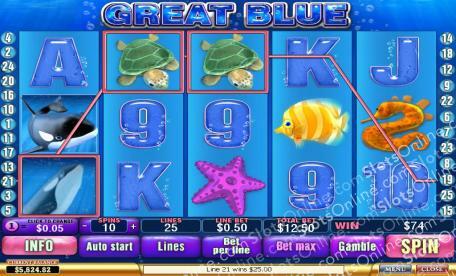 Immerse yourself in the deep end of the ocean, and explore the many wonders of this exhilarating slot. Click here to play! There is so much to enjoy, and even more to win, so come on down and start playing today. Great Blue is a wonderful 5-reel slot played across 25 pay lines, where the more lines opened allows for more winning combination opportunities. The Killer Whale is Wild and can become any other symbol on the reels except Scatters. Not only does the Wild payout up to 10,000 times your original stake, but it will also double all prize money on winning spins. The Pearl is Scattered and can show up anywhere on the reels, as well as payout up to 500 coins. Plenty of other ocean creatures will aid you in winning a stack of cash, so dive in and start playing Great Blue today for awesome cash prizes! Pearls are Scattered, pay out up to 500 times your initial stake, and can earn you a stack of free spins. The Killer Whale is Wild and can be substituted to complete winning combos. Spin up all 5 on an active payout and be awarded 10,000 coins. Three or more Scatterd Pearls on an active pay line will send you to the Bonus Round where you can win Free Spins and more.